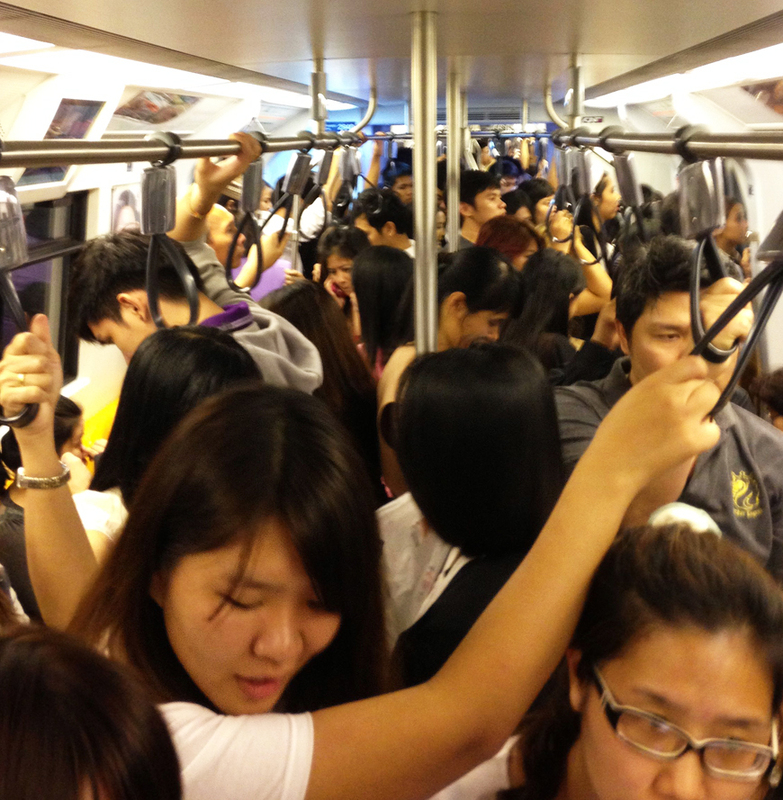 Bangkok: No taxis available at the airport, and all trains into town are seriously crowded. I am one of a very large number of individuals caught in the rush on a Friday evening. Somebody said later it’s because all the international schools start again on Monday. No other way, it’s decided for me, okay, I accept, I am subject to the system, the public transport system and I have no control over it. I am being ‘taken’, it’s about the process, rather than any particular person controlling the process. I could create a Controller in my imagination like the bosses, the management and blame it all on them/him/her/it, but it’s better to not do that…. There’s not a ‘self’ in the equation – the deed is done but there is no doer, using the Passive Voice language function to express the Buddhist Truth of no-self (anatta), and I came across an interesting post about this the other day [Link to: Just A Little Dust]. The ‘self’ is absent. Sounds are heard, food is tasted, the chill wind of September is felt upon the skin. And there’s nobody there that feels it, unless I consciously put together an identity composite, in which case I feel the chill (Active Voice). Language tells a story, creates a fiction that I can get lost in; only partially aware that it’s a constructed thing and most of the time I’m clinging to a concept of selfhood, an assumed identity. Thankfully, in the Passive Voice, there is no doer, things are done; the cognitive process is about ‘how it works’ rather than ‘what it is’. The world is seen – I had an eye operation recently and what I didn’t expect was that it turned out to be an opportunity to contemplate this phenomenon of the experiencer. There’s the experience of visual stimuli entering the eye through a lens created by means of an industrial process and somehow the ‘me’ part of it is not there like it used to be. The lens inside my left eye is made of plastic, there’s a particular clarity in the colours, the quality of light and a fascination with the way plastic surfaces refract the light; plastic food wrapping, mineral water bottles, car windscreens. It’s all very new and quite interesting – maybe because I still have the ‘old vision’ in the untreated eye, something to compare it with. I can see the world through the old eye as well as the new eye. It’s like the linguistic ‘voice’ can be both passive and active and I’ve understood it mostly in the active form; the process of selﬁng is grasped at as an entity and identified with – a controlling thing. In the West it’s a ‘belief’. My difficulty with anatta has been extricating myself from the Judeo-Christian conditioning that assumes the existence of an eternal soul. I notice Thais don’t have this problem. Even after 30 years in the East, I still struggle with my Western conditioning; an everlasting identity, the idea of it still lingers; a shadow of reality. A couple of hours and I’m at Morchit BTS near Chatuchak standing in the rain and D comes to get me in the car. The thought arises, the car is driven but there is no driver…. I prefer that translation – can you provide a link? The Bahiya Sutta is quite honestly one of my two or three favorites – it’s so poetic and clear.